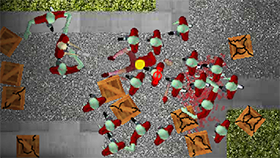 Zombocalypse is an interesting action game developed by IronZilla. In Zombocalypse, you control Jon Fulton. Jon Fulton is the only survivor of Bravo Team. His helicopter suddenly goes down on a mission. And now, Bravo Team is surrounded by hundreds of zombies. 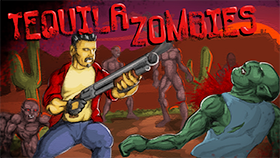 Your mission is to help Jon Fulton kill zombies and survive as long as possible. At the beginning of the game, you will use a machete to fight. Sometimes, these crates will be dropped from the sky and you can collect them to get the bonuses and weapons. Zombocalypse gives you many different weapons, such as Pistol, Sniper Gun, Shotgun, Assault Rifle ... However, each gun has a limited number of bullets. When your gun runs out of ammo, they will disappear. Each time you kill a zombie, you will have points. When you create combos, you can use special skills. You have many special skills to kill the zombies, it is a missile strike (call in a single missile strike on target position) and you need 25 kill combo to activate it, air strike (drop a line of 3 bombs in the direction you’re facing when you place the marker) and you need 50 combo kill to activate it, attack chopper (call in an apache helicopter that provides cover fire for 5 seconds on your position) and you need 100 combo kill to activate it. Each time you are bitten by zombies, your health will decrease. When your health is reduced to zero, the game is over. However, you can find HP kits in these wooden crates. In addition, Zombocalypse has 20 achievements waiting for you to win, such as pick up 100 crates in 1 play, kill 1000 zombies in 1 play, kill 7 snatchers in 1 play ... Good luck and have fun! Use W/D or left/right arrow key to move. Use S or down arrow key to pick up items. Use A or up arrow key to activate the special skills. Zombocalypse has two mobile versions for Android and iOS devices. In Settings, you can customize quality, sound FX, music, brightness and gore. You need to train the soldier of the Special Forces to unlock the second character. You need to complete all achievements to unlock the remaining characters. 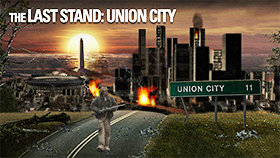 If you want to play Zombocalypse Unblocked, just click at freegames66.com. This is a trusted site for those who want to play unblocked games. At freegames66.com, you can play many quality unblocked games, all for free. Now, enter Zombocalypse Unblocked, kill zombies and survive as long as you can. Play now!